Lino Gómez feito is coach of the Spanish Federation of Karate, best known for his work with the Spanish women’s team who have been world champions, and took five second places this means that we have been in the World Champioschips final the last 12 years, and one third in the World Cup, and two University Championships and eight European titles, the last 5 in a row. His club participants in various age categories in the Spanish club championship 2011, In the senior class competedt the Chilean world champion (2008 in Tokyo) David Dubos who has a long relationship with Linos club. I had the opportunity to interview Lino Gómez and David Dubo. About his impression of this year’s club championship Lino said. “I love the championship, the impression was good, many teams in all categories and a generally high level”. There has been a lot of success of the women’s team on the World and European level. Why have the Spanish women’s team been a world power in karate for so many years? “No doubt because we are a group that operates in the same direction, the team has been renewed, with a winning spirit and commitment that gradually seeps down from generation to generation. The team has always won over individuality, we have done poorly individually in the championship but we have always managed to get good results in team. 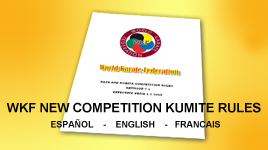 There have been many changes in rules and a new change is coming, what is your impression of the new rules in kumite, which has been proposed? David Israel Dubo Firmani said about his collaboration with Lino? Lino Sensei has helped me to become the athlete I am today. He has contributed a network of people, for example, Sensei Kohata and I have become a part of Gensei Ryu family, which is in line for a humble, nice and very basic approach to techniques, which I and Sensei Alvaro enjoy. What distinguishes Spanish karate from Chilean? Essentially the difference lies in what karate training is, technical quality required of students is the key factor that leads to knowledge so that the athlete reaches higher with a much higher technical quality than in Chile. Add to this a greater frequency of high level competitions, organized by the Spanish Federation of Karate, which means that competitors are constantly training to maximize their attributes. What is your next goal in karate? Revisit in September to Oviedo, under the wing of Sensei Lino, since the Golden League in Germany, and after that the Pan American Games in October as the games are just as the Mediterranean Games in Europe, then we train with Sensei Alvaro World Cup in France in 2012 as we have strong focus on.